Typhoon LUPIT has changed its track toward northeast. According to Japan Meteorological Agency and others, it is likely that the typhoon will not make landfall at Honshu, but Izu Islands will be affected by the typhoon. It is a regret that the launch of the H2A rocket failed today. This rocket is supposed to be used for launching the successor of Japanese meteorological satellite called MTSAT-1R, so this failure may lead to the delay of the launch, which is already a pending issue. 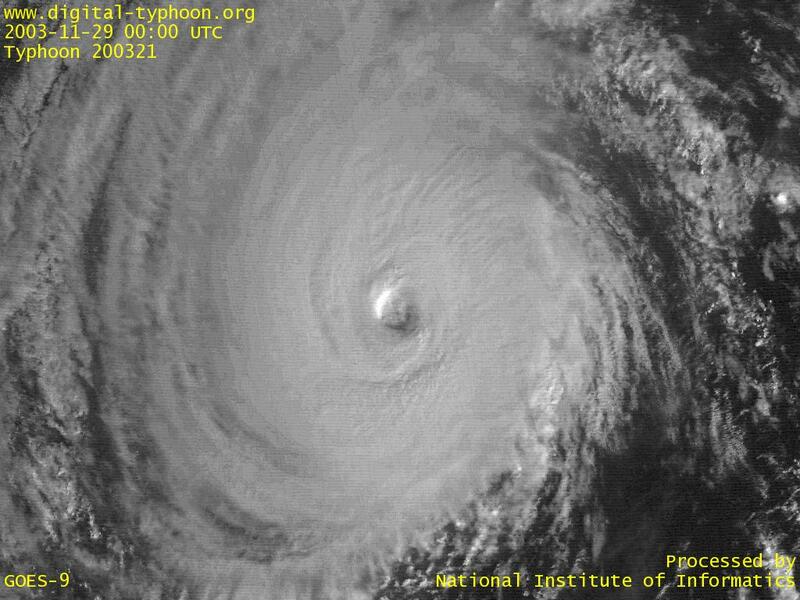 We have been tracking the change of the eye shape of Typhoon LUPIT for a few days, and it looks like today the eye is more shrinked. The spiral shape of typhoon clouds is getting less tight, but this typhoon does not weaken easily. It is also found from the animation of Typhoon LUPIT that the expansion of the eye we observed yesterday did not proceed gradually, but it proceeded very quickly in a short period of time in a way that looks like the sudden collapse or "avalanche" of eyewall clouds. The clouds in the center of Typhoon LUPIT on 0000 UTC -- 1024x768 (VIS) : 1536km in width and 1024km in height. 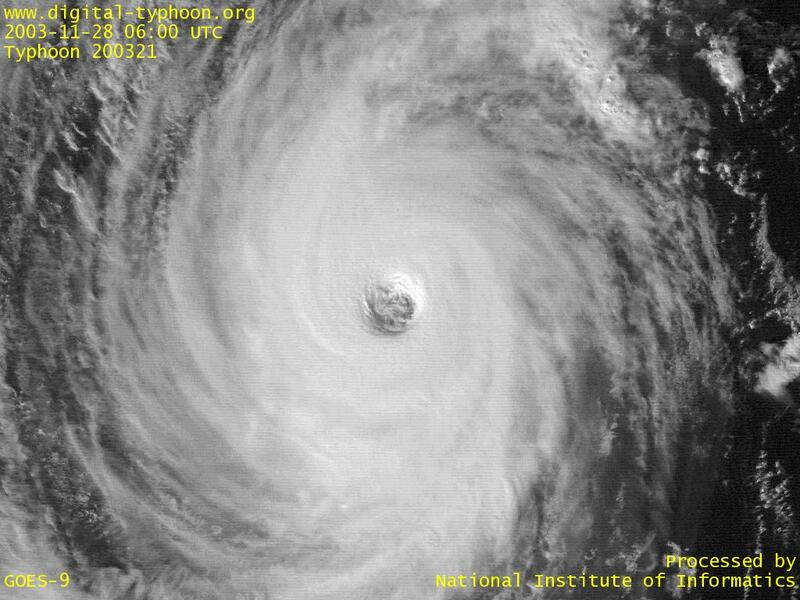 The typhoon still maintains its big eye. The clouds in the center of Typhoon LUPIT on 0300 UTC -- 1024x768 (VIS) : 1536km in width and 1024km in height. The eye of the typhoon seems to be shrinked. The clouds in the center of Typhoon LUPIT on 0600 UTC -- 1024x768 (VIS) : 1536km in width and 1024km in height. The eye has shrinked or, rather, the slant of the eyewall clouds is getting less steep. Typhoon LUPIT is forecast to move far south of Honshu Island (around Ogasawara Islands) according to Japan Meteorological Agency, but to draw near to Japan according to JTWC. We will see which forecast is correct in a few days. 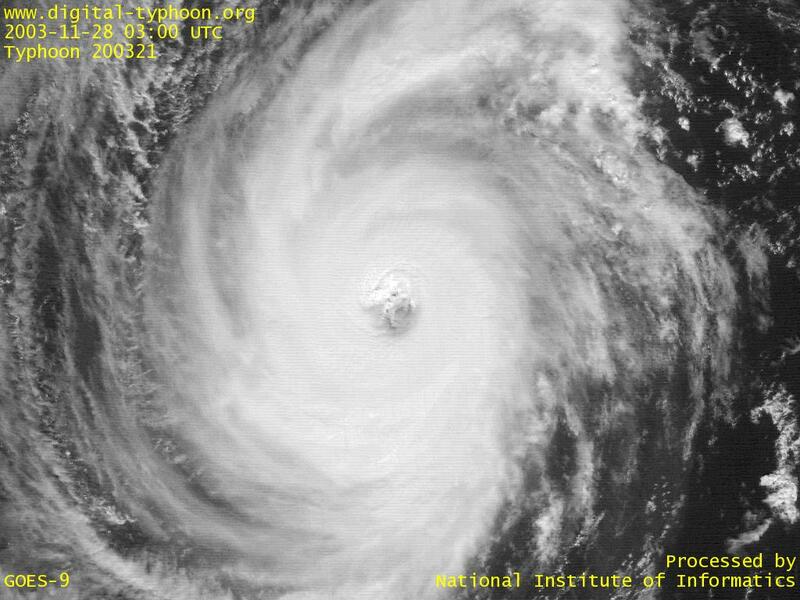 The intensity of the typhoon seems to peak out, and the shape of the eye is getting vague and irregular, but the typhoon will keep its strong intensity for the next few days. The clouds in the center of Typhoon LUPIT on 0000 UTC -- 1024x768 (VIS) : 1536km in width and 1024km in height. It looks eyewall clouds is getting vague and irregular. The clouds in the center of Typhoon LUPIT on 0300 UTC -- 1024x768 (VIS) : 1536km in width and 1024km in height. The eye is getting bigger. The clouds in the center of Typhoon LUPIT on 0600 UTC -- 1024x768 (VIS) : 1536km in width and 1024km in height. The eye has expanded even bigger with the diameter of 100 km. This size is almost equivalent to the size of the Kanto Plain around Tokyo. 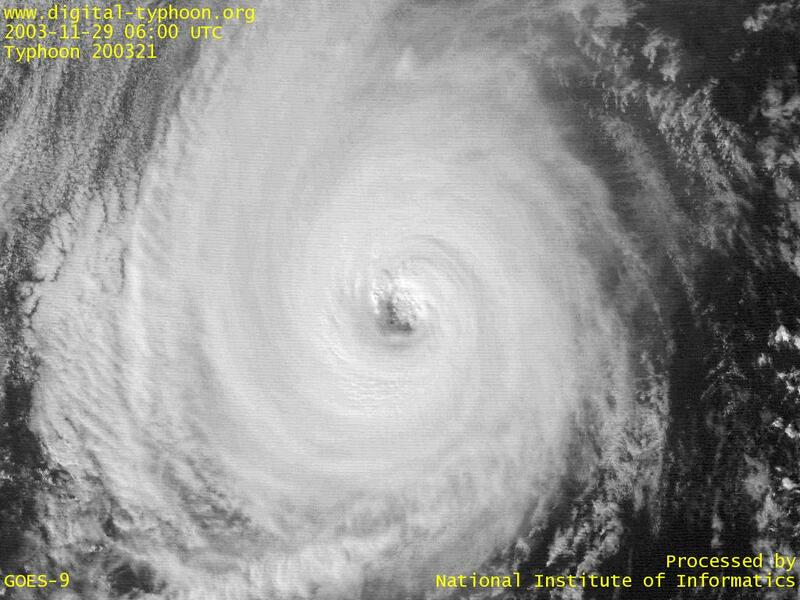 This expansion of the eye indicates the sign of weakening. Typhoon LUPIT is forecast to draw near to south of Japan, according to JTWC. 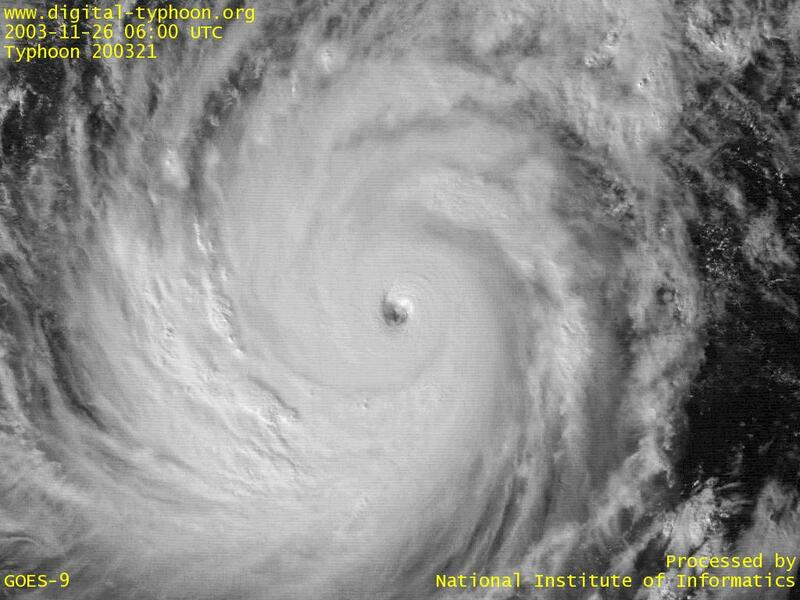 This typhoon finally has become the strongest level among the typhoons in 2003, but fortunatelly it is moving over the area where islands are rarely found. The clouds in the center of Typhoon LUPIT on 0000 UTC -- 1024x768 (VIS) : 1536km in width and 1024km in height. It looks the northwestern part of eyewall clouds reflect sun light, while southeastern part is shaded. The clouds in the center of Typhoon LUPIT on 0300 UTC -- 1024x768 (VIS) : 1536km in width and 1024km in height. The position of the sun has moved since the above image, the shade in the eye has also changed its shape. The clouds in the center of Typhoon LUPIT on 0600 UTC -- 1024x768 (VIS) : 1536km in width and 1024km in height. The eye is still clearly visible. Wallpaper Images -- You can see the latest meteorological satellite images of the globe in various sizes. 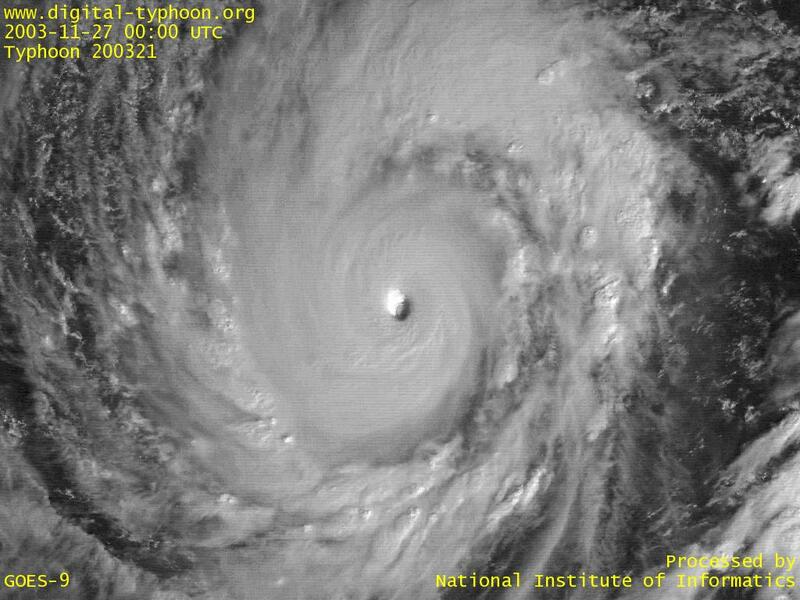 Typhoon LUPIT's eye is now visible from the space, and it really intensified into a super typhoon. 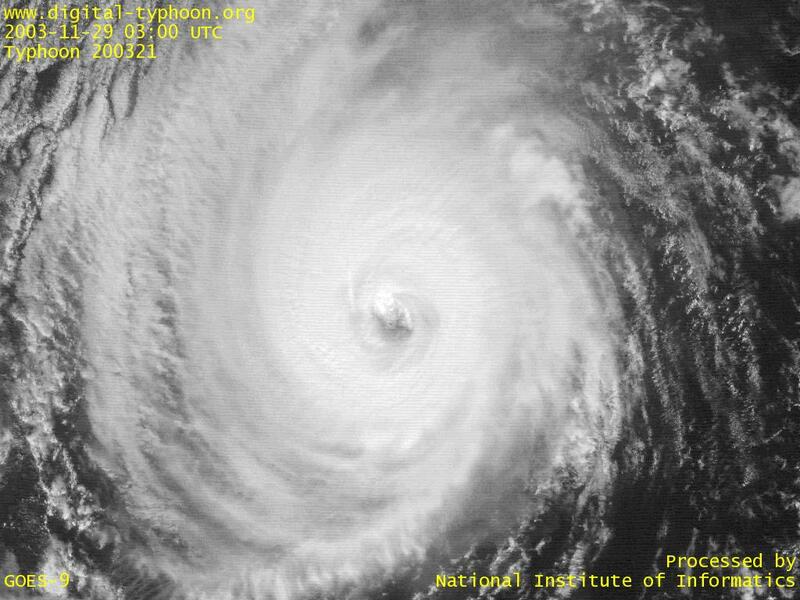 The spiral shape of this typhoon looks like the most balanced shape among all the typhoons in 2003. The clouds in the center of Typhoon LUPIT on 0600 UTC -- 1024x768 (VIS) : 1536km in width and 1024km in height. Typhoon LUPIT is moving across Caroline Islands. According to the newspaper article below, Yap Islands and Ulithi Atolls are not well prepared for typhoons due to the less frequent attack of typhoons. Another concern is that the islands are low-lying and more susceptible to damage. 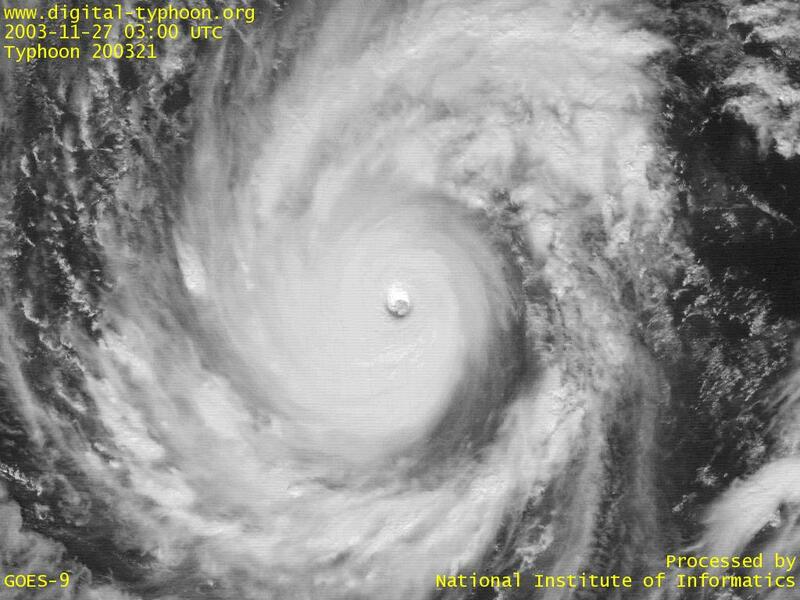 The eye of the typhoon is not clear at this moment, but it has a well-developed cloud cluster in the center. 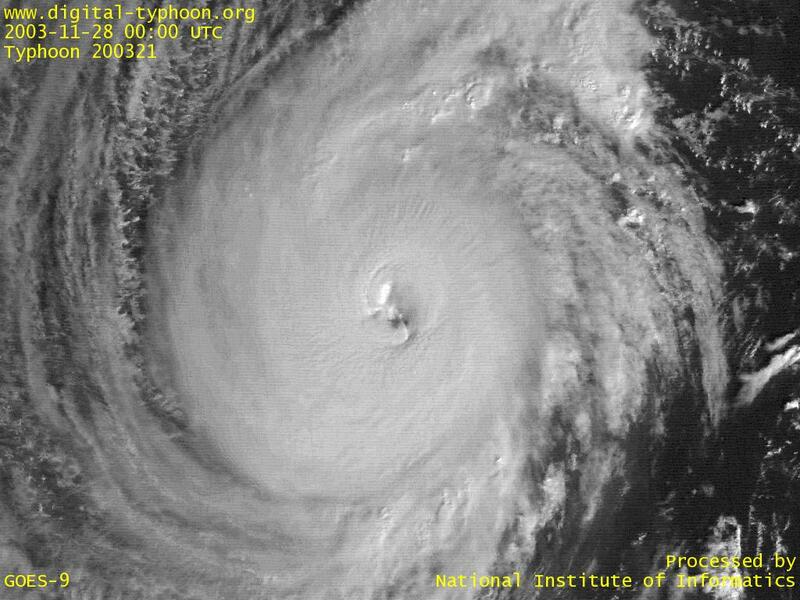 Typhoon LUPIT passed far away from Guam, but it is forecast to pass near Yap Islands with its intensity at peak. This typhoon is developing into a stronger and more dangerous one with its clouds becoming better organized. 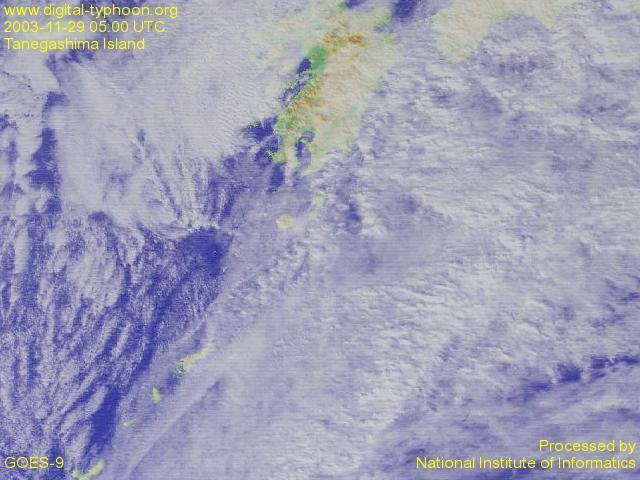 Typhoon LUPIT was born. The forecasts say that, for the time being, it moves westward on the Pacific Ocean with intensification. 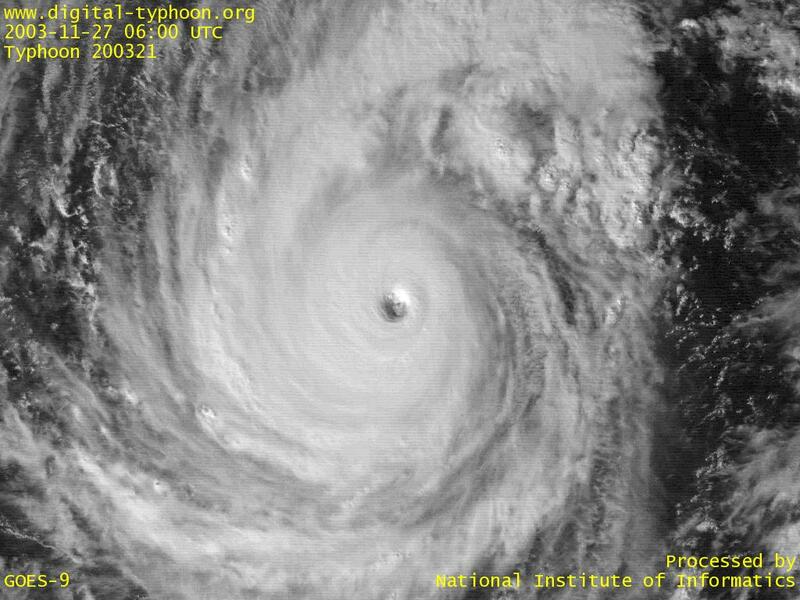 Satellite images of Typhoon LUPIT by NASA.